Private Tuition - Wedding Dance!! LEARN, IMPROVE or STYLE UP YOUR DANCING! 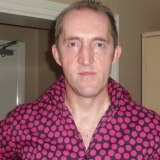 GEORGE VORGIC is an ex World Seniors Modern Jive finalist, a qualified LeRoc instructor and has been involved in delivering jive all over the UK for over 15 years. Together with his partner Liz they also specialising in teaching individuals or couples. George has a magnificent mirrored studio at his Doncaster home, which is also available for private hire. Contact him on 07724 609999 or email George . LEARN YOUR FIRST WEDDING DANCE WITH GEORGE & LIZ!! Why not learn a routine that will not only 'wow' your guests but will make your first dance one of the highlight of your special day.